The AquaMAX 390 (G390SS) features a patented in-built mixing valve gives you 390 Litres first hour delivery with a five star energy rating and ten year cylinder warranty. 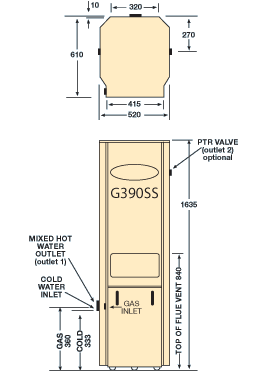 The mixing valve adds a controlled mix of cold water, giving up to 205 Litres of 60°C hot water delivery in the initial draw, with 185 Litres of recovery per hour after that. This Hot Water System is suitable for existing homes. As an installation option, your plumber can also install twin temperature delivery so you can enjoy the convenience of 65°C hot water in the kitchen and laundry when you need it, while taking comfort in the knowledge that it is safer for kids with bathroom hot water taps at 50°C or lower.